Formally known as the Agriculture and Nutrition Act, the Farm Bill is a massive spending package that will deliver $867 billion over 10 years to subsidize farming and nutrition. Passage was no easy task and the previous funding bill expired months ago. The bill includes funding for SNAP, formerly known as food stamps, which was a central point of contention. Republicans tried to increase work requirements for SNAP recipients, a move that the party largely backed away from in recent weeks. 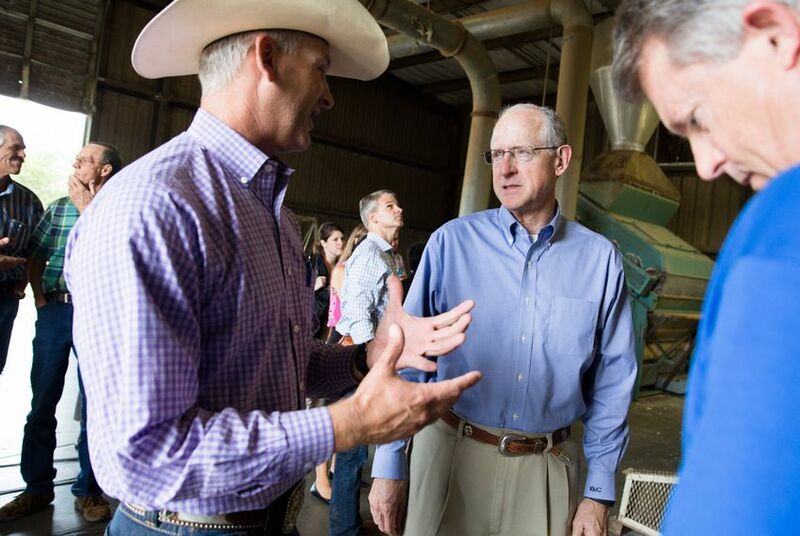 The bill's passage is the crowning legislative success for U.S. Rep. Mike Conaway, the Midland Republican who currently chairs of the House Agriculture Committee. It passed with widespread support in the U.S. Senate, including from the two Texans – John Cornyn and Ted Cruz – who serve in that chamber. The House approved its version in a 369-47 vote. Texas delegates also overwhelmingly voted in favor of the bill. Thirty two of the 38 Congressional members from Texas voted for it, five voted against and one did not vote. The new Farm Bill comes as the Texas agriculture industry reels from Trump's trade wars and southeast Texans suffered substantial damage from Hurricane Harvey. It also includes a new provision legalizing hemp, NPR noted earlier this week. Still, most of the funding – 80 percent – benefits SNAP recipients. The Farm Bill is rare, in that it traditionally has the support and opposition of bipartisan forces. It first came about during the Great Depression but in recent decades has become an increasingly contentious piece of legislation because of the scale of its spending. Even so, its passage has been contingent on the support of rural members of Congress who represent the agriculture industry that relies on federal crop insurance and urban members who advocate for the SNAP program. The Farm Bill technically expired at the end of September but the economic consequences had yet to make their way back to the average Texas farmer or SNAP recipient. Since July, a sprawling conference committee made up of House members and Senators haggled over the details, including the GOP's attempts to increase SNAP work requirements. "Ultimately, I had to make a decision between making as many inroads on reform in these areas as I could or allow farmers and ranchers to be held hostage," Conaway said on the House floor earlier this week. "Faced with that choice, I chose the route of getting this farm bill done." Laramie Adams, national legislative director of the Texas Farm Bureau said he was "very thrilled" with the final bill. "It's all about certainty," Adams said. "It's really the best word to describe what farmers are most concerned about – being able to be confident as they plant their crop that if something were to go wrong then ... they're protected because a lot of these things are beyond their control. They work very hard to maintain their crops but it doesn't always work out." Some Texas Republicans were disappointed that the stricter work requirements for SNAP beneficiaries didn't make it into the final bill, but still voted for it. "I hate it," U.S. Rep. Roger Williams, R-Austin, said before the vote. "I think there need to be work requirements but Conaway did a really good job in making what he could happen." Williams, whose district cuts through a wide swath of rural Texas between Austin and Fort Worth, said the bill was "as good as we can get." "It is what it is so I'll be voting for it," he said. "I'll be voting for my farmers." U.S. Rep. Ted Poe, a retiring Republican from Houston, said that he would also support the bill despite the lack of tightened work requirements. "It's not perfect," Poe said. "It never is." Trump also expressed support for the bill on Tuesday. And Cruz's support was noteworthy. As a freshman, he voted against the 2014 Farm Bill. Moreover, he frequently aligns himself with the conservative group Heritage Action which lobbied hard against the Farm Bill's passage because of the lack of more work requirements for SNAP recipients. "At the end of the day, I voted for the farm bill because it's important to millions of Texas farmers and ranchers. Agriculture is a critical backbone of the Texas economy and the farm bill provides needed crop insurance and certainty for farmers across Texas," he said. "So, I made the decision on balance. There was more good than bad." He also signaled confidence in U.S. Agriculture Secretary Sonny Perdue. "Part of that decision was also informed by Sec. Perdue's commitments to use the regulatory authority of the administration to toughen the work requirements in the SNAP program and I'm hopeful that the administration will follow through on those commitments and I look forward on working closely with them to do so," Cruz said. Texans serving on the conference committee that worked out the bill's details included Conaway, fellow Republican U.S. Reps. Jodey Arrington of Lubbock and Jeb Hensarling of Dallas, and Democratic U.S. Reps. Eddie Bernice Johnson of Dallas and Filemon Vela of Brownsville. Conaway was at the center of partisan and bicameral negotiations. "This farm bill has not been easy," he said on the floor. Conaway will turn over his committee gavel to the Democrats in the new year and transition to ranking member. This moment marks the pinnacle of his time running the agriculture committee. He told the Tribune last year that if he failed in this effort, he would not deserve the traditional portraits in committee hearing rooms that honor past chairmen and chairwomen. “I will not have earned it unless I get a farm bill passed," he said at the time. Correction: Due to an editing error, an earlier version of this story incorrectly stated the number of Texas Congressional delegates and the number of those who supported the Farm Bill. Thirty two of the 38 Texans in Congress voted for the bill.